ORLANDO – Going for their second state title in as many years, the Miami Central Rockets (13-1) played host to the Seffner Armwood Hawks (14-1) in the Florida Citrus Bowl. By game’s end the Rockets won 52 -7 over the Hawks. 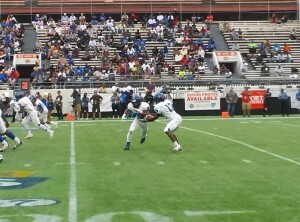 The Armwood Hawks run a play during the 2013 Class 6A State Championship Game. “It’s a certain expectation we have as a staff and with our players. This isn’t a shock. 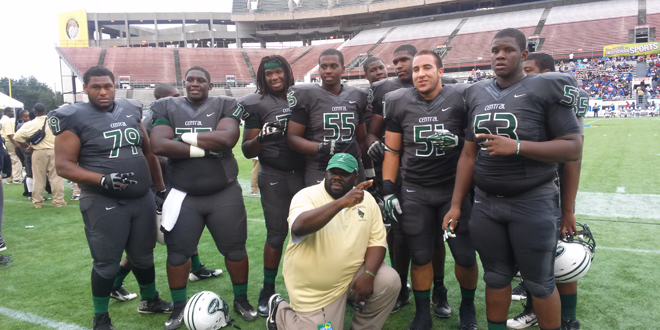 Work isn’t over cause we will be here next year,” stated head coach Roland Smith of Miami Central. Missing in action was the Rockets stud running back, Joseph Yearby, but luckily the back-up wasn’t too bad. Dalvin Cook got things started on Central’s second drive going 37 yards around the right side and turned on the speed once he hit the corner to put his team out front 7-0. Then not even two minutes later on a misdirection that caused the defense to lose the runner; Malik Adams took in 7 yard carry for the second touchdown of the quarter for the Rockets. Armwood’s offense was almost non-existent at the turn of the first quarter. They went into the second down a 150 yards of total offense. But after another Miami Central touchdown drive that put the game at 21-0 with 6:12 left in the quarter the Hawks offense came alive. Driving the field Armwood’s Noah Johnson put his team on his back. Making a couple of nice passes that was also supplemented by a 15 yard run late put his team in scoring position. Then after a pass interference was called that put Armwood on the Rockets 11 yard line … the Hawks put it all together. Johnson found wideout Trevor Laurent in the back right corner for the first score of the game the team. Miam Central took a 21-7 lead into the half. After the break Miami Central came out just as fast as the first half. Dalvin Cook capped off a five play drive when he scampered into the end zone with 10:32 remaining in the third quarter. Then on the ensuing possession the Rocket defense took advantage of a hurt Noah Johnson and picked him off. Tavius Brown intercepted and took the ball back 43 yards for a touchdown. Something we had yet to see closed the third quarter of the game. Two consecutive field goal attempts. 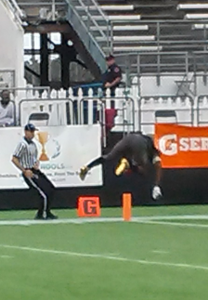 While Central converted their attempt of 44 yards … Armwood did not. The Rockets took a 38-7 lead into the closing quarter. After the missed opportunity for a field goal, Dalvin Cook raced 80 yards to a touchdown to start the fourth quarter. Cook finished the game with 226 yards on 19 carries with four touchdowns. “I did my job to secure the win. Three (Yearby) was gone so it was on me to make sure we came out on top,” said Cook. So for the second year in a row the Rockets are on top. The back-to-back 6A state champions.